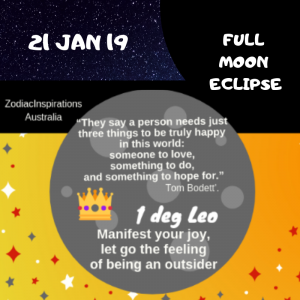 We start this week with a Full Moon eclipse at 1 deg of Leo! This eclipse closes the series of eclipses under the polarity Aquarius/Leo. Eclipses announce big change. Lunar Eclipse is a change related with our emotions. What does it take to make us to content? Venus and Jupiter are getting close to each other telling us how important is to have fun in our journey to cope with 2019!! Sun and Moon are together asking us to be more creative to contribute to our tribe! !